This is a follow-up to my original post on the Stretford public realm proposals, before they had been officially published. If you want to understand the background to the proposals, I suggest reading that. The proposals have now been published as part of a public consultation running from 25 September to 16 October 2015. So to start with, look at that visualisation above that’s included in the proposals. Looks great doesn’t it? A Stretford town centre with no cars, barely any roads, where people are free to roam. It’s not real though, and it has nothing to do with these proposals. By including this, Trafford are creating a impression, that the rest of the proposals don’t deliver on. 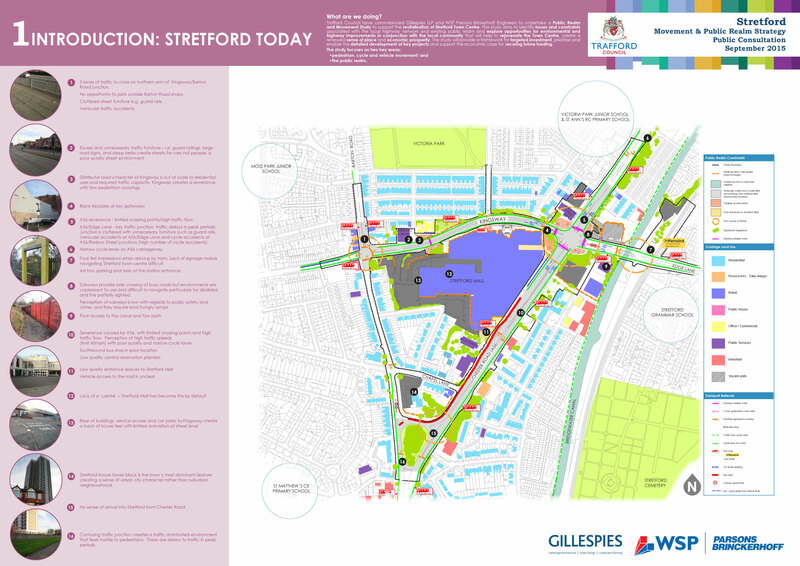 The introduction covers the issues facing Stretford town centre, highlighted as 16 key points. I think most people with any experience of Stretford town centre would recognise these. Stretford town centre is isolated from the rest of the town by three busy roads, the A56 Chester Road, Kingsway and Barton Road. These act as a significant barrier to use as is evident in the footfall of Stretford Mall. 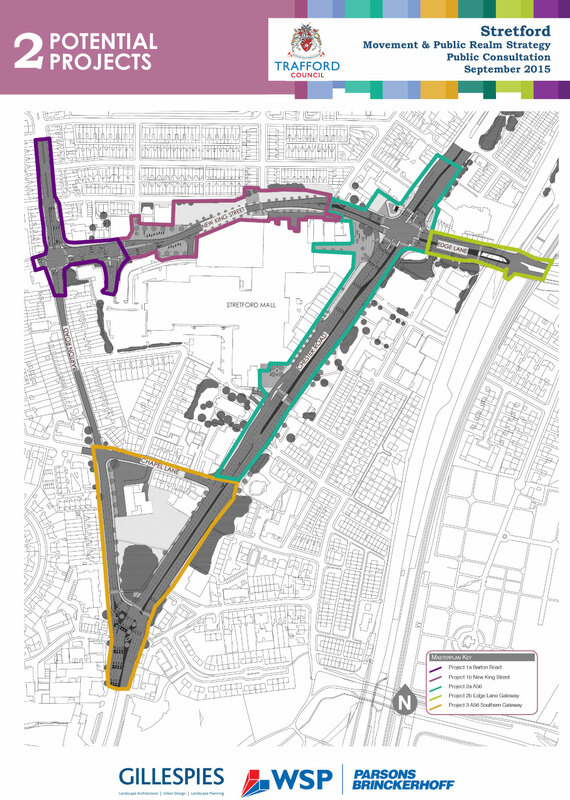 The proposals focus on three projects, New King Street / Barton Road, A56 / Edge Lane Gateway and Southern gateway, detailed below. 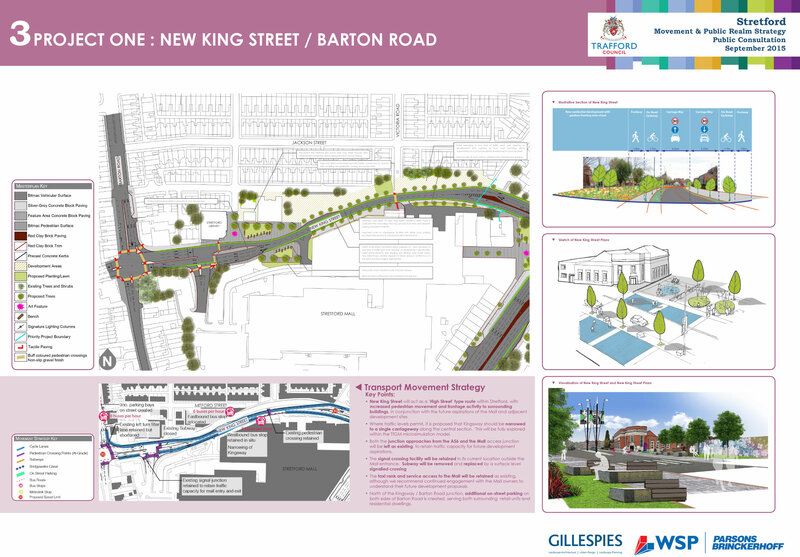 This project focuses around what is currently Kingsway and the junction with Barton Road. In particular, it is proposing to reduce the lanes and traffic calm parts of Kingsway to make it more of a place, while maintaining the current numbers of lanes at either end. Speed limit reduction 20mph has now been scrapped from these proposals, this is a significant loss. I doubt whether these measures are appropriate for the level of traffic along Kingsway and I suspect we’d see similar issues to those identified in Poynton. Cycle provision on Kingsway is on-road and it’s not clear whether or not it’ll be mandatory, given amount of work being carried out, why is it not fully segregated? There’s no cycle provision on Barton Road, even though it’s a key route into Trafford Park for those travelling from the south of Stretford. No attempt has been made to reduce the number of lanes or speed of traffic on Barton Road. Speeding is a significant problem here, which along with limited crossing points, makes it dangerous and unpleasant place to be. 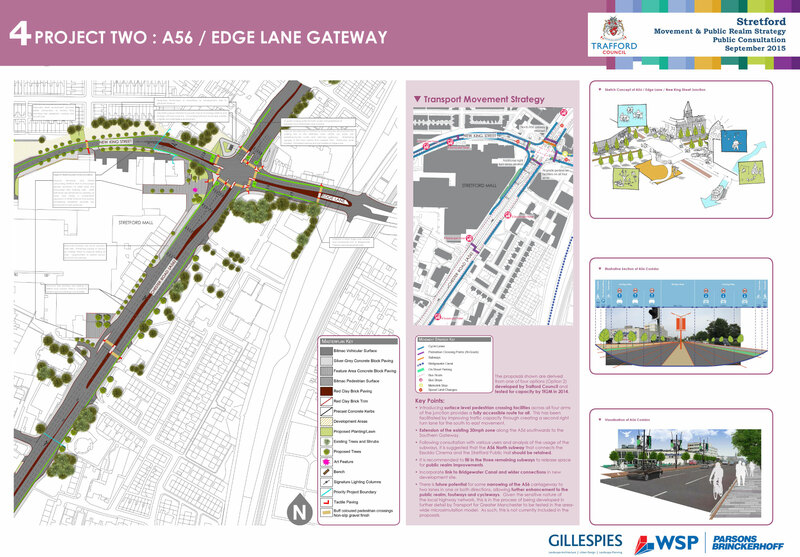 This project focuses on the A56 and the junction with Kingsway and Edge Lane. In particular, it proposes to introduce surface level, at grade pedestrian crossings, the removal of three of the subways and a reduction of speed limit to 30mph. The surface level, at grade crossings are a welcome addition and give people an alternative, particularly a night. But the removal of three of the subways will be a significant loss. For a lot of users, the subways provide a convenient way of getting across this junction and there’s a lot that could be done to improve the subways to make them fit for today’s use. As Easy As Riding A Bike’s post Rehabilitating the underpass shows that subways are often the better choice to at grade crossings, when done well. Removal of the subways appears to be more about freeing up space to increase the number of lanes to Edge Lane and increase traffic flow. The speed limit reduction 30mph is a welcome change that is long overdue. Unfortunately, as the A56 will continue to be six lanes, the change will be ignored by most of the drivers along this stretch. The proposal talks about potentially narrowing the A56 to “two lanes in one or both directions”. I don’t understand why this is mentioned in the proposals, it doesn’t seem to be in any way likely. The cycle infrastructure included on the A56 is 1.5m of unsegregated, on road cycle lanes in each direction, that doesn’t even appear cover the whole of this stretch of road. I’m guessing this the case as one of the visualisations includes a white silhouette of someone on a bike riding on the road. In addition, what’s included in the illustrative section appears to show the cycle lane in the door zone for the parking bays. The cycle infrastructure at the A56 / Kingsway / Edge Lane junction is of very poor quality, consisting of nothing more than useless ASLs that are often ignored and dangerous on road cycle lanes. 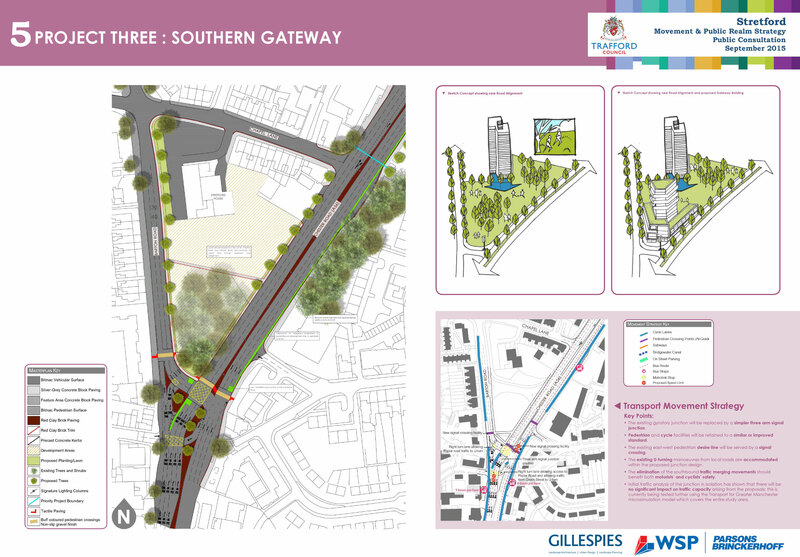 The southern gateway project proposes to address the issues with the A56 gyratory at Stretford House, simplifying the junction and freeing up land for development. The removal of the gyratory will massively improve access to the A56 from Barton Road. This is something that can be quite a danger for motorists and is much worse for those on bikes. Apart from some useless ASLs, there is a complete lack of any cycle infrastructure at this junction. As I mentioned previously, this a key route into Trafford Park. The proposals do nothing to address the congestion on Barton Road. A road that was never built to carry the amount of traffic it does now, and often resembles a rather noisy and polluted car park. Much of the points I’ve raised here, I raised in my original post and sent to the team working on the proposals. Between then and now, nothing’s been done to address any of these points and if anything, these updated proposals are even less ambitious than the originals. The Trafford Green Party has proposed the building of a tunnel under the A56 to move the through traffic away from Stretford town centre. Although this sounds like an attractive idea, and certainly, there’s successful examples of this, such as Boston’s Big Dig. What’s the reality of it happening? Tunnelling under Stretford would cost a lot to do, certainly a lot more than what’s being spent on these proposals. Given the cuts to services being made by Trafford Council, I can’t see there being any political will to spend this kind of money. I also have questions around the practicality of tunnelling under Stretford. Where would the tunnel entrances be located? How would the tunnel deal with the significant amount of traffic to and from Chorlton? The Trafford Green Party had said these issues would be addressed in the proposals and plans they were putting together. Though I’ve yet to see these materialise. So is there any other alternatives we can look at that are appropriate for the issued faced in Stretford? Part of the Mayor of London’s Vision for Cycling, the Mini-Hollands programme has given three outer London boroughs the funding to improve local cycling facilities. Although the focus is on cycling, much of the improvements made will make the boroughs more liveable for everyone. The following video shows some of the excellent work Waltham Forest has been undertaking in Walthamstow. Is there something Trafford could learn from this in its approach to Stretford? I was quite critical of TfGM’s original Oxford Road proposals. Though TfGM has listened to the feedback the proposals received and have worked with local cycle groups to improve the scheme. I still think there’s room for improvement. But overall, the scheme is on par with some of the best work happening in the UK right now and is far ahead of anything else happening in Greater Manchester right now. The following video is a walkthrough of the changes being made along Oxford Road. This shows what we could achieve in Stretford in there was the will to do it. The Netherlands have an approach to street design called Sustainable Safety (see the following two informative posts from the Cycling Embassy of Great Britain and As Easy As Riding A Bike). One of the core principals of Sustainable Safety is that roads have a single function, either as a trunk, distributor or access road. Unfortunately in the UK, we don’t have the same classification when it comes to street design. So our roads quite often end up being a jumbled mess of different functions that give a poor experience to everyone. This can been in the streets in much of Stretford and particularly those around the town centre. Over recent years, there’s been a trend in the UK to try to turn these kind of streets into places. Not by changing the function or reducing the traffic flow, but by making cosmetic changes to the street design and furniture. This has been dubbed Placefaking. The problem with Placefaking is that although you may make the street appear more attractive, you don’t address the function of the street as the traffic flow remains the same. This is the case with Exhibition Road in Kensington and Chelsea and closer by in Poynton. So, looking at these proposals, it’s hard to see that they amount little more than increasing traffic flow for routes to Chorlton and Placefaking through cosmetic changes. The core issue of the town centre being cut off from the rest of Stretford by three busy roads isn’t addressed, so the problem will continue. So, going back to that visualisation at the beginning. That vision of a Stretford town centre functioning as a cohesive whole, and a pleasant place where people choose to spend their time. Will this be achieved by these proposals? No, and I don’t believe these proposals should progress any further without a significant rethink. 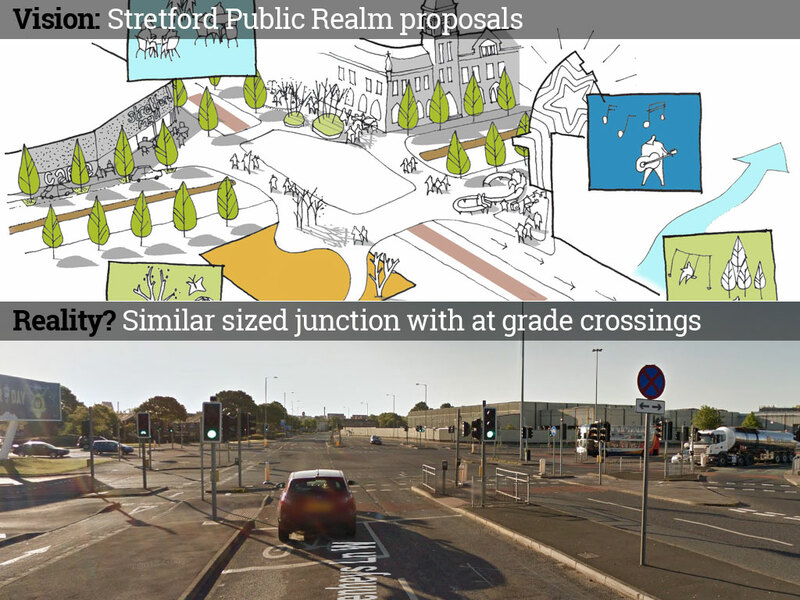 Details of the consultation can be found on the Stretford Public Realm Improvements page on the Trafford Council website. You can email your comments to stretfordmasterplan@trafford.gov.uk or complete an online questionnaire. The consultation closes on 16 October 2015.
hi. Agree with pretty much all you’ve said, especially concerns over lack of safe provision for cycling. Money being spent on roads and a large pot for new road schemes. There is no reason why Trafford could not bid for monies like any other authority, but it won’t. Because of course it wants to be seen as a model council in the eyes of its masters in Whitehall. It is a matter of will not lack of cash. Moreover, the amount of land freed up at ground level would have a significant value to offset against costs. We have a scheme for the tunnel which would see the tunnel commence just south of the southern gateway and re-emerge just before the canal crossing. Local traffic could use a greatly reduced road space at current ground level. As you imply, the current scheme is a bit of fluff to fob off the community with a bit of landscaping and some road changes (themselves with cost implications but no offsetting financial benefits). This will not save the centre from its present death by traffic worship and, as you say, there needs to to be a fundamental rethink. The Green Party will be sending its comments before the end of the week. I do have some cynicism around the tunnel proposal, mainly because I can’t see Trafford Council or those currently in control ever considering it a viable option. Though I agree, it’s probably true that only a tunnel or something similarly ambitious would really address the problem facing Stretford. Again, maybe being somewhat cynical, I don’t believe Trafford Council are really that interested in properly addressing the problems in Stretford. Certainly, that’s the conclusion I’ve reached from reviewing these proposals. There’s been a significant lack of detail on what’s being proposed. When I’ve questioned this previously, I’ve been told The Green Party are working up some detailed designs, but they’ve never materialised. Without any detail, I doubt the proposals would ever get taken seriously. I disagree with the proposal of having a tunnel emerging near the canal crossing on the Stretford/Gorse Hill border. Tunnel entrances are not particularly pleasant places, having a tunnel entrance here would have a significant detrimental effect on this area, essentially moving the problem further north. It would also concentrate the pollution in the vicinity of two schools, Victoria Park and St. Anne’s. For the tunnel to work for the whole of Stretford and not just for those in the centre, it would need to emerge at the White City roundabout, where it could provide access to the stadiums or central Manchester. A significant amount of the traffic passing through Stretford is travelling in the direction Urmston/Trafford Park or Chorlton. From what’s been described, this traffic would be at surface level still, so we’d still be plagued with too much traffic, certainly far more than local traffic. Like I say in the post, there’s plenty of examples of successful tunnel projects. I’ve seen first hand The Big Dig in Boston and the massive impact it’s had there. But I think The Green Party need to work up proper proposals and address the issues I’ve mentioned to be taken seriously. The proposal identifies poor cycling facilities and A56 accident hotspots on the first page, but does nothing to address these issues in the rest of the document. Why they would narrow Kingsway with the associated relaying of the road surface, kerbs, paths etc. without putting a proper cycle lane on the safe side, it just shows the lack of thought and wasted opportunity. I think the landscaping/public space ideas are a reasonable start and would be a hell of an improvement on the existing ugly and oversized Kingsway area. I agree that a road tunnel would be the best solution, and compared with the investment in crossrail London, the cost would be a drop in the ocean. Stretford Mall barely gets a mention in the plans, is it just too big for current requirements? could it be reduced in size for a reasonable cost, to free up land for public realm? There would still be the issue of the A56 cutting off access to the Metrolink and canal though. I sent my full comments to Trafford before the deadline.